Earlier this year, I joined a friend on a ceremonial visit to a Brisbane cemetery. Part of my friend's Sufi practice involves reminding himself of his mortality by visiting a cemetery every Friday. As we walked through the Muslim section, we noticed some well-preserved graves of young men, most of whom did not make it to their 25th year. The gravestones were decorated with the calligraphy of verses from the Koran. Among the deceased was one 24-year-old named Allah Ditta (a name which literally means Gift from God), a member of the 14th Punjab Regiment. Ditta was one of any number of Indian soldiers who fought the Japanese at Malaya and Singapore during World War II. Following the fall of Singapore, many of these Indian troops were taken to the notorious POW camp in Changi. These soldiers were fighting as part of an army defending possessions, then current and former, of a colonial power. 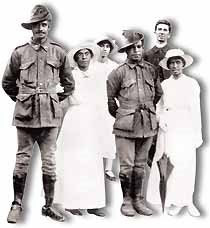 Indians and Australians fought the Japanese side by side, trying desperately to keep the Japanese away from the Australian mainland. Indians of all creeds paid a heavy price in property and lives to prop up the Raj, the British Crown's most prized possession. Indians didn't just fight the British in their epic independence struggle. As a means of obtaining independence, many Indians followed Indian independence leader Mahatma Gandhi's instructions and fought with the British. Often forgotten are the sacrifices these Indian troops made to defend British colonial possessions in South-East Asia against Japanese invaders in World War II. This was not a war to defend India as such. Many Indians would have initially warmed to the idea of their colonial masters being humiliated by an Asian power. Melbourne author Neelam Maharaj's 2007 historical novel Surviving Heroes tells the stories of Indian soldiers and their families who fought the Japanese in Malaya and Singapore. This historical novel is woven around the life of Ramesh Kapur, an Indian officer in the British army. Ramesh and his fellow Indian soldiers were encouraged by Mahatma Gandhi to join the British war effort. Yet Indian troops were subjected to racial discrimination and humiliation by their British commanders. The Japanese knew this, and they sponsored the highly respected Indian National Congress dissident Subhash Chandra Bose to raise the Indian National Army from among Indian POWs. Of course, patriotism combined with war can make scoundrels of even the most loyal. Gandhi strictly forbade Indians from using violence to fight the British. Hence, Indian POWs joining the INA to fight the British with Japanese help knew they would be regarded as traitors to Gandhi's non-violent struggle. At the same time, the POWs witnessed firsthand Japanese brutality against British, Chinese and Malay soldiers, and civilians slaughtered in cold blood. For Ramesh and his colleagues, joining the victors against the enemy at home must have been tempting. At the very least, it would have been seen as the fastest route to joining their loved ones back home. Some of Ramesh's closest friends joined the INA's march through Burma. But when the tide turned, the army was abandoned by fleeing Japanese forces and charged with treason by the British. Its leader, Bose, died mysteriously in a plane crash during the dying days of the war. Of course, the Indians weren't the only soldiers subjected to racial discrimination and humiliation. Thousands of indigenous Australians, some as young as 16, fought for their country in every overseas military operation. Reg served in such far away places as Libya, Crete, Palestine and New Guinea. Reg's brother lost his life while fighting on the infamous Kokoda Track. “The truth about our black Anzacs is that thousands fought in overseas wars, hundreds died, but very few were ever formally recognised, or rewarded. When black soldiers returned home, they were not permitted to access returned servicemen land grants. They were denied war pensions and they were refused membership of (and entry to) RSL clubs all over the nation. Most who died after their return were buried in unmarked graves. No doubt those who espouse the white armband view of history will be offended at my bringing up these issues on an occasion such as this. After all, we have all benefited from the sacrifices of our past generations who gave their lives so that we might be free. But what sort of free nation believes that the only way to improve the lot of its oldest inhabitants is to breach racial discrimination laws? So today, at the going down of the sun, make sure you remember Geoff Shaw. He served six years in the army, seeing active combat in Borneo and Vietnam. If he can make it to a march in a major metropolitan city, chances are the RSL won't now relegate him to the back of the procession as happened in past years with other indigenous diggers. But then, he probably can't afford the airfare given that half his veteran's special pension will be quarantined. Irfan Yusuf is a Sydney lawyer and writer. First published in the Canberra Times on ANZAC Day, Friday 25 April 2008. What is wrong with Dicky Kerbaj? Doesn’t he do any research before writing his articles? Or does he just make a few phone calls, send out a few e-mails and cobble something together? Kerbaj is supposed to be a journalist. His job is to report. His job is not to engage in a crusade or a jihad. Yet his stories concerning Griffith University and its Islamic Research Unit (GIRU) are generally little more than the presentation of one side of a debate. Clearly Kerbaj is taking sides. Those who have followed Kerbaj’s reporting on these issues will note that he has never quoted from myself on any of these issues. I’m saying this not to big-note myself. However, it is the case that, since April 2005, I have had some involvement in public discussion on these topics. Yet I refuse to go on the record when asked to do so by Richard Kerbaj. I simply have no confidence in his ability to understand or even accurately report what I tell him. That I must say this about the reporter of our national broadsheet is quite disturbing. Kerbaj must understand that his role is to report. It isn’t to take sides. If he wishes to write opinion pieces, his opinion editor is just a phone call or an e-mail (or perhaps even a few desks) away. The strangest thing about so much of Kerbaj’s reporting is that he claims to have some kind of expertise in Muslim affairs. He presents himself as an expert due to his untested Arabic language skills. But when asked about where he studied Arabic or what degree of proficiency he has, Kerbaj is rather coy. I have no objections to Kerbaj reporting what he sees or heard or reads. Whether it is embarrassing to Muslims or Arabs or Lebanese or Sudanese or anyone else is really immaterial to his role. But when he begins to enter the realm of opinion, often citing anonymous sources in the same manner as his cousins at FoxNews, Kerbaj opens himself up for criticism. Kerbaj’s repeated errors on even the most basic Islamic theological matters show that so many of the sectarian, ethnic, linguistic and other nuances are way out of Kerbaj’s league. The results can often be embarrassing. For instance, in his report yesterday, Kerbaj claimed that Dr Mohamad Abdalla, the convenor of GIRU, is a follower of the Tabligh Jamaat (TJ). At the same time, Kerbaj has been attempting to show that a measly $100,000 donation from the Saudi embassy shows that Saudis will expect the promotion of Saudi-style wahhabism. Yet if that was the Saudi’s goal, why would they make their donation to a man whom (as Kerbaj suggests) is associated with a group that Saudi religious authorities regard as deviated and even promoters of idolatry? In today’s piece, Kerbaj again displays his ignorance of religious doctrine, this time of Christian doctrine. He cites Stephen Crittenden as suggesting that, by using the term “Unitarianism” as a translation of Tawheed, the Vice Chancellor of Griffith was associating Wahhabism with the Unitarian movement that arose in England and the United States. Professor O'Connor faced further criticism yesterday from a trio of long-time ABC religion journalists and commentators - Rachael Kohn, John Cleary and Stephen Crittenden - who said he had confused the Christian doctrine of Unitarianism with the Islamic sects of Wahhabism and Salafism in an opinion article published in The Australian. Professor O'Connor wrote: "Unitarianism is also known by its critics as Salafism or Wahhabism, after an 18th-century Islamic scholar Muhammad ibn Abd-al-Wahhab." The ABC commentators responded by saying: "Ian O'Connor's equation of Wahhabism and Salafism with Unitarianism is utter nonsense. "Unitarianism emerged as a liberal Christian movement and gained ground in the early years of American democracy." Had Kerbaj any basic knowledge of comparative theology, he would have seen the absurdity of this alleged claim by Crittenden. Kerbaj also attributes this claim to another ABC religion presenter, Rachel Kohn. I find it impossible to believe that Dr Kohn would subscribe to such nonsense. Indeed, to even describe Unitarianism as a Christian doctrine is sheer madness. Orthodox Christianity (and by that term, I don’t just mean Eastern Orthodox, but include Catholic and Protestant churches) is a strictly Trinitarian affair. The Unitarianism of the medieval theologian Arius or of latter day Unitarians such as Isaac Newton or Joseph Priestley bears little resemblance to the Athanasian Creed. Tawheed is a basic Islamic doctrine which argues that God is One. Wahhabi/Salafi doctrine takes this concept further in some respects than mainstream Sunni and Shia doctrine. Yet essentially Tawheed is a doctrine replicated in Judaism and in Unitarian forms of Christian belief which mainstream Christianity regards as heresy. All this should be obvious to anyone with even elementary knowledge of the doctrines of the Abrahamic faiths. I doubt religious affairs reporters like Linda Morris or Barney Zwartz would make mistakes on this kind of stuff, even if it involves quoting a Radio National presenter. I think what has happened is the Kerbaj has tried to make a mountain out of a mole hill of split hairs. He has more than likely misunderstood something he’s been told by Crittenden et al and has reported his misunderstanding in an attempt to find something contradicting the Griffith VC’s op-ed. So what is the real issue? Is it whether the Griffith VC understands the difference between Wahhabism and a form of nominally Christian belief that virtually all Christians regard as heresy? Is it whether Dr Abdalla is associated with an Indian Sufi missionary movement? Is whether human rights in Riyadh will form part of the curriculum? Let’s put this in perspective. We are talking about $100,000. Compare this to the amount invested by the Australian government in the Centre for Excellence in Islamic Studies, of which GIRU forms a part. At the end of the day, we are talking about a postgraduate research unit. It is a place where people go to pursue their doctorates. They already have a particular topic in mind which is somehow linked to Islam or Muslims. GIRU provides them with an environment where they can pursue their research interest. ... his continued pursuit of this issue will be deemed little more than another witch-hunt. Perhaps a good note to end off this piece would be with a letter to the editor published in today's Australian which addresses the heart of the issue. YOUR front-page reports attacking Griffith University over partial funding of an Islamic Research Unit smacks of McCarthyism. Open-ended funding of research positions is not a form of payola: how many chairs are endowed by businesses without strings attached? It’s more than possible for a diplomatic arm of a nation with which we and the US have strategic and diplomatic ties to give such funding. Saudi Arabia, for all its flaws, just happens to be home to the key spiritual sites of Sunni Islam. Will your newspaper condemn the ethics of academics working in Catholic universities, as if they were answerable only to the Vatican? Will you support full, independent public funding of research, or will you continue to encourage universities to rely on private funding but foment scandal when the funding comes from politically incorrect sources?